National Travel and Tourism Week is an annual tradition for the U.S. travel community. It’s a time when travel and tourism professionals across the country unite to celebrate the value travel holds for our economy, businesses and personal well-being. Listen to Southwest Louisiana locals on how Tourism Works for Lake Charles/SWLA! The Lake Charles/SWLA CVB will be hosting a range of fun events and activities throughout the week. Check back soon for a schedule. How does Tourism Impact You? National Tourism Week celebrates the importance of tourism as an industry throughout the United States. Learn more at www.ustravel.org. 2017 was a record-breaking year for tourism in Louisiana. The state welcomed a record 47.1 million visitors in 2017, representing an increase of nearly 500,000 over the 46.7 million visitors reported by DK Shifflet in 2016. Those visitors spent $17.5 billion, or an average of $371 per person. 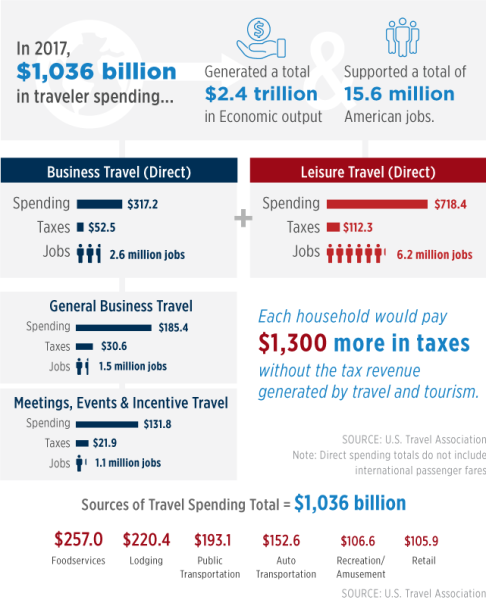 The travel and tourism industry generated $1.8 billion in state and local sales tax revenue, an increase of 4.5 percent over the $1.7 billion in state and local sales tax revenue generated in 2016. Investing in tourism to promote and market Louisiana leads to thousands of direct and indirect jobs for the state. At the end of 2017, U.S. Bureau of Labor Statistics data shows 236,300 jobs were the result of visitor spending in Louisiana, meaning 1 out of every 8.5 working adults in Louisiana is employed as a result of the tourism industry. For Calcasieu Parish, that is $732.09 million dollars added to the local economy.